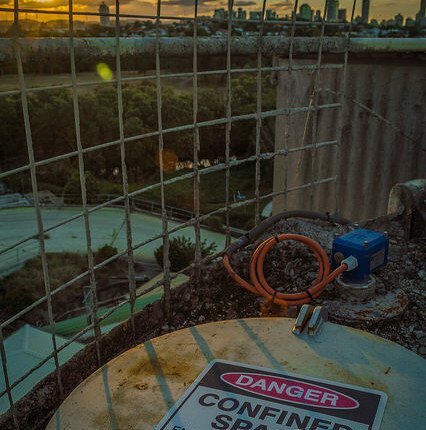 What is a confined space, what risks are involved and what should you know to ensure you are working safely in these conditions? Below, we explain how you can make sure that you and your team are working safely in a confined space. A confined space is a partially enclosed or fully enclosed area that is large enough for a person to enter but was not designed for someone to work in on a regular basis. Typically such spaces need to be accessed from time to time for inspections or repairs. Some examples of such spaces include tanks, wells, pipelines, manholes, and bins among others. Often space has only one point of entry and exit and it lacks things like proper ventilation, utilities, and other items found in a typical space designed for regular work activities. While uncommon, injuries that happen in a confined space can be devastating. The risks include explosion due to inadequate ventilation or asphyxiation and suffocation caused by atmospheric hazards such as toxic gasses or lack of oxygen. If these conditions exist in the space but a worker is caught unaware, injury and even death can occur suddenly. Other risks include the presence of harmful bacteria or mold that can cause mild coughing to a more severe immune reaction. Depending on the configuration of the space and what it is used for, entrapment or engulfment hazards may be present. The first step is identification and documentation regarding space, the potential hazards that may be present and the safety precautions that should be followed. Such documentation is sometimes referred to as a hazard analysis and should identify not only the condition that may be present before a worker enters the space, but should also identify any hazardous conditions that could develop as a result of the work being done within the space. This documentation should be easily accessible by workers and reviewed prior to each entry into the space. All such spaces should be properly secured to prevent unauthorized entry and appropriate warning signage should be posted. Warnings should be highly visible and should clearly state that only authorized personnel should enter. Access points should be inspected regularly to ensure they are secure and warnings are still visible. Communication is key to protecting workers who may have to enter the confined space. Prior to entry, go over the assessment with them to make sure they understand the risk. Ensure that they wear any Personal Protective Equipment (PPE) that has been identified as required and that such PPE is in good working order. Also, employees should never be permitted to work in such spaces alone. For help with implementing a safety plan around confined spaces, contact us here!